Not only is it a collection of great recipes, some of which I can no longer live without, but also her precision and accuracy in describing both principles of the technique as well as subtle details of each steps are MIND-BLOWING. You are guaranteed to be successful if you do exactly what she tells you to do. I do just that, and let myself indulge in a fantasy of being a domestic diva as I take out my prized Le Creuset from the oven and witness complete transformation of what’s inside from assortment of ingredients to an amazing meal. I might even throw an apron on. All that while I am developing some serious muscle. Fantastic. As I read through the book, I couldn’t imagine what this dish would taste like although I was immediately intrigued by it – But by that time I had already been a follower after a series of some huge success (Chicken Breasts Braised with Hard Cider & Parsnips? Check. Yankee Pot Roast? Check. Cauliflower, Potatoes & Peas Indian-Style? Check. TWICE) so I had no hesitation to try this one as well. And the rest, as you know, is history. 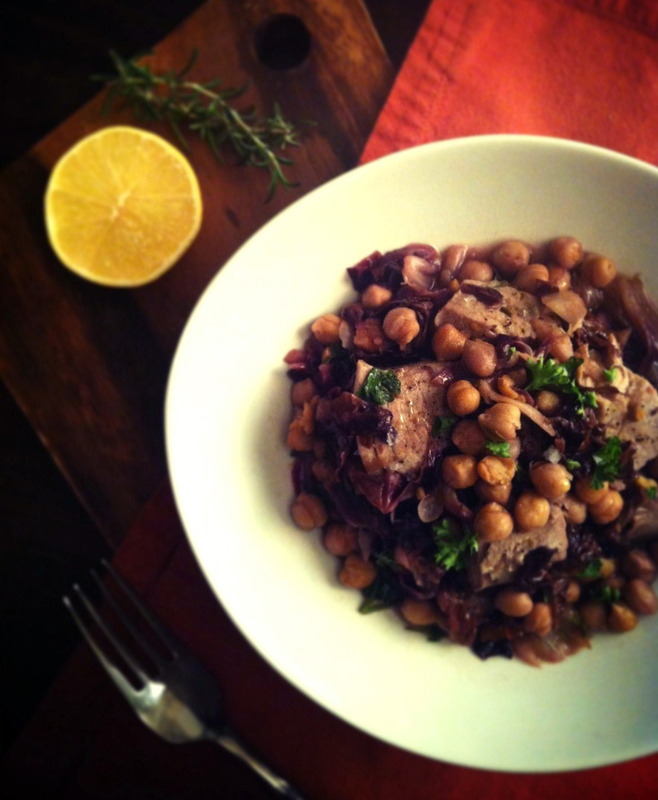 Turned out the combination of chickpea and tuna is something common in Italy (Ms. Stevens says she was inspired by one of her pantry favorites from Sicily), but addition of radicchio and rosemary provides such a complexity and depth to the flavor, and the use of hearty tuna steak gives it a proper entree status. It is pretty substantial so I’m usually happy with about a third of one tuna steak on my plate with crusty bread as a main course, accompanied by a light salad. The book suggests it could be a part of antipasto – That would be impressive, too. For a braised dish, this particular recipe doesn’t require oven and it’s relatively quick to make, since tuna shouldn’t be cooked too long once it is added. However, you should plan to make it a bit in advance as it should be served warm or at room temperature. As a matter of fact, tuna is even more moist and the flavor further develops next day (but do not reheat as tuna gets tough! Just take it out of refrigerator an hour before you eat). My schedule often forces me to eat my lunch at my desk, but I make sure to close the door when I have leftover of this and enjoy every bite of it without being disturbed, although my co-workers may have been wondering about all the moaning coming out of my office. 1. Infusing the olive oil: Combine the oil, garlic, rosemary, and pepper flakes in a medium high-sided skillet (10- or 12-inches). Heat over low heat, covered, until the garlic is fragrant, soft, and lightly golden, 4 to 5 minutes. Lift the lid frequently to check that the garlic isn’t frying or browning; you want a gentle infusion of flavor into the oil. Set aside. 2. The radicchio: Cut the radicchio in half from core to top. With a small knife, carve out the small core. Place the halves cut side down on a cutting board and, using a larger knife, slice into 1/2-inch-wide shreds. Add these to the infused olive oil. Return the skillet to medium heat and saute, stirring occasionally, until the radicchio is wilted, about 5 minutes. 3. Braising the chickpeas: Add the stock, lemon juice, chickpeas, and a pinch of salt to the pan. Bring to a simmer, cover and simmer gently for 8 to 10 minutes to meld the flavors. 5. Serving: Transfer the tuna steaks to a cutting board and divide into serving pieces. Set the tuna in warm shallow pasta bowls. Stir the parsley into the pan, taste for salt and pepper, and spoon the chickpea-radicchio garnish, along with plenty of liquid, over the tuna. Finish each serving with a squeeze of lemon juice, a thread of good olive oil, and a pinch of fleur de sel or coarse sea salt.